Personalization is no longer a luxury in the eye of the consumer. In 2016, it’s a requirement. While customers spend more and more of their time on the Internet, and more of their Internet time is being access through the mobile device, they want to block miscellaneous spam ads on the small screen more than ever. With the introduction of app-indexing by Google in 2015, search engine optimization (SEO) is no longer a strategy reserved only for a website content developer. 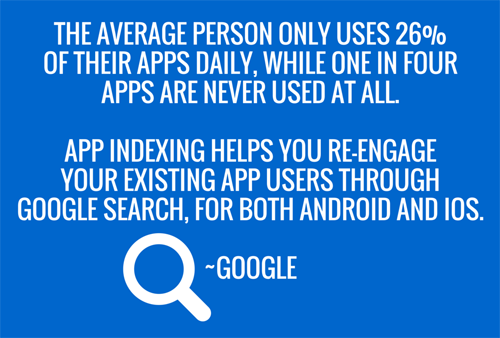 Two can play this game, as mobile app content now has the ability to be crawled and pulled-up in search as well. We saw the popularity of video on mobile in 2015, and 2016 is set to be the year that marketers are able to harness this trend to their benefit through mobile content marketing. The best way for mobile-savvy brands to take full advantage of consumers’ time spent on video specific sites such as YouTube, is it incorporate its branded video content into its mobile app. For a mobile content marketing strategy to be most effective, it must direct its content efforts to the right audience. This involves knowing the custom profile of the ideal consumer in terms of demographics, interests and hobbies, and catering to their needs accordingly, at the right time. This is achieved through a mobile strategy that is able to deliver specific geo-targeted content. With mobile surpassing desktop use in 2015, 2016 will officially solidify the platform’s prominence with consumers. With the hand-held device reigning superior comes the responsibility of brands to create content that enables consumers to take action in the same way they previously would on a website accessed through a PC. Distributing your content via mobile is key. The data that brands can collect via their users’ mobile devices will be instrumental in understanding their consumers and responding with the most relevant content to provide the ultimate customer journey. As the Vice President of Marketing for Zumobi, Marla Schimke brings more than 17 years of experience in marketing leadership for both start-ups and Fortune 500 companies including Microsoft and Ernst & Young. She is a digital media pioneer who combines a unique blend of technology and marketing experience to successfully position cutting-edge solutions to media and consumer audiences.